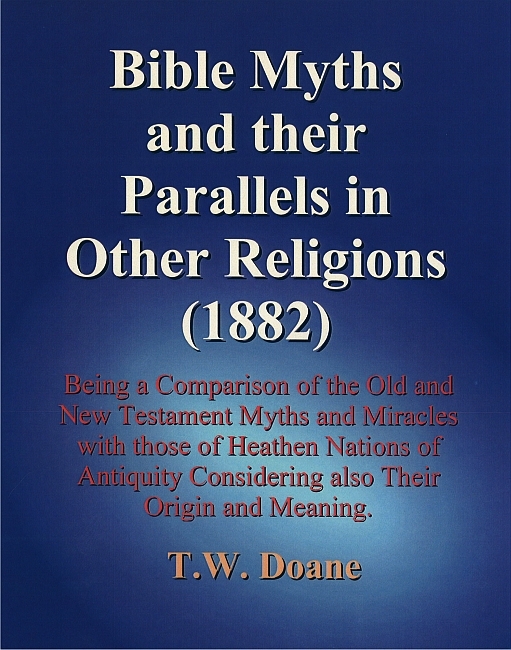 (1882) a Comparison of the Old and New Testament Myths and Miracles with Those of Heathen Nations of Antiquity Considering also Their Origin and Meaning. Some of the contents: The Creation & Fall of Man; The Deluge; Tower of Babel; Trial of Abraham's Faith; The Exodus; Samson; Jonah; Miraculous Birth of Christ Jesus; Slaughter of the Innocents; Crucifixion; etc. The biographers of Jesus, although they have placed him in a position the most humiliating in his infancy, and although they have given him poor and humble parents, have notwithstanding made him to be of royal descent. The reasons for doing this were twofold. First, because, according to the Old Testament, the expected Messiah was to be of the seed of Abraham, and second, because the Angel-Messiahs who had previously been on earth to redeem and save mankind had been of royal descent, therefore Christ Jesus must be so. "The last of the Jinas, Vardhaman, was at first conceived by Devananda, a Brahmana. The conception was announced to her by a dream. Sekra, being apprised of his incarnation, prostrated himself and worshiped the future saint (who was in the womb of Devananda); but reflecting that no great saint was ever born in an indigent or mendicant family, as that of a Brahmana, Sekra commanded his chief attendant to remove the child from the womb of Devanda to that of Trissla, wife of Siddhartha, a prince of the race of Jensaca, of the Kayapa family." In their attempst to accomplish their object, the biographers of Jesus have made such poor work of it, that all the ingenuity Christianity has yet produced, has not been able to repair their blunders. The genealogies are contained in the first and third Gospels, and although they do not agree, yet, if either is right, then Jesus was not the son of God, engendered by the "Holy Ghost," but the legitimate son of Joseph and Mary. In any other sense they amount to nothing. 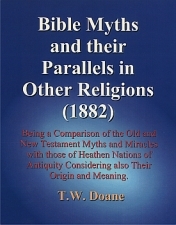 That Jesus can be of royal descent, and yet be the son of God, in the sense in which these words are used, is a conclusion which can be acceptable to those only who believe in alleged historical narratives on no other ground than that they wish them to be true, and dare not call them into question.